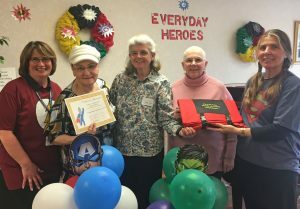 OSWEGO – St. Luke Family of Caring volunteers were saluted for the their superhero-like contributions they make in the lives of those served on the St. Luke healthcare campus, during a gathering held in their honor at St. Luke Health Services in Oswego. The event brought together volunteers of all ages from St. Luke, Bishop’s Commons and St. Francis Commons. Volunteers from across St. Luke’s Family of Caring affiliate organizations gathered for a celebration held in their honor during National Volunteer Week. The theme of the celebration – “Volunteers are Superheroes” thanked the hundreds of dedicated volunteers who help add to the quality of life of those served across the St. Luke healthcare campus and in our community. Pictured taking part in the celebration is (left to right) Peggy LiVoti, Activities Director at St. Francis Commons with volunteer “superheroes” Eileen Sprague; Judy Pratt; Lois Jean Radomski; and Cheryl Cullinan, Director of Activities at Bishop’s Commons. 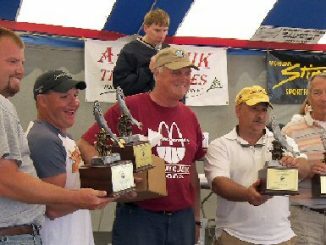 Last year volunteers at the three St. Luke affiliates, who ranged in age from teenagers to those in their nineties, contributed more thanr four thousand hours of their time participating in hundreds of programs, activities and outings with residents across the healthcare campus. Cheryl Cullinan, Activities Director at Bishop’s Commons, acknowledged the many student volunteers from local schools, including SUNY Oswego, for their tremendous level of engagement, many of whom are on the healthcare campus almost daily either volunteering as part of a group or individually. “We are fortunate to have a great relationship with our local schools; they contribute to a great atmosphere and support an intergenerational learning environment that benefit the students and our residents alike,” she said.